This article outlines how to configure your division priorities within the CRM. 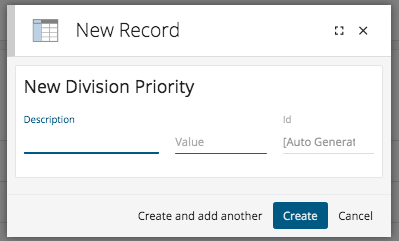 Division records can be categorised based on a configurable priority field. For example you may have Key, Medium or Low priority customers but you may refer to each of these levels differently depending your business' terminology. Therefore, you can configure this list to suit your business. To configure your Division Priorities you will require Prospect 365 Administrator rights, if you require these then please speak to your key CRM user or our Customer Services Team. To edit your Division Priorities, click on the settings icon in the bottom left-hand corner. Once within the Settings Centre, navigate to the People & Places section & scroll down until you reach the Division priorities configure option. By selecting the 'Click to Configure' link the Configure Division Priorities window will open. Within this window all of your current Priorities will be listed. To add a new one click on the + icon in the top right-hand corner. You can then give the new division priority a name & an associated value. The Value is to determine the hierarchal order for each priority. For example a Key Account priority type may have an associated value of 1 being the highest priority. Once happy with your new Priority click Create.